Alassari Plantation Bali is the new frontier for relaxing, romantic, luxury, holiday retreats. 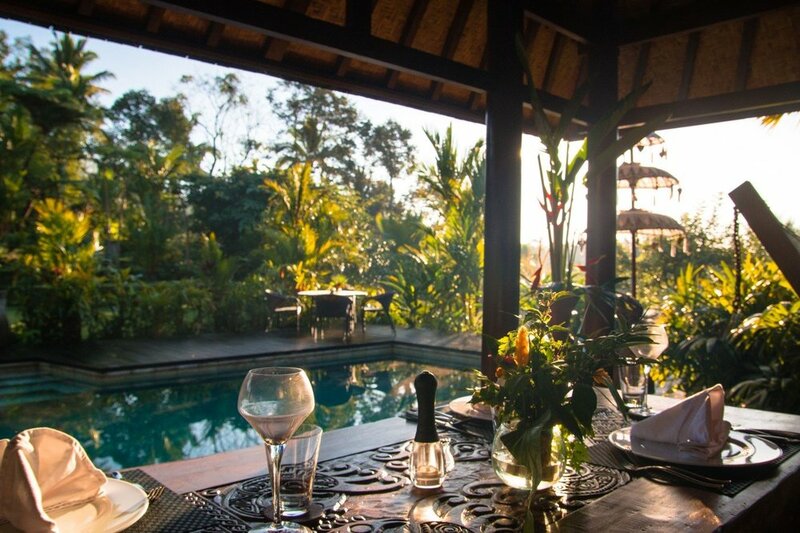 Set in a private coffee plantation and high on the mystical Mount Batukaru in Bali's central rainforest, you'll stay in your choice of luxury villas, our private honeymoon suite or the new open sided bamboo treehouse amongst the treetops. Luxury and ancient architecture meet on a mystic mountain. "imagine yourself staying in your own private villa in the Lush Tropical Rain Forest"
Service is excellent and the houses are very well decorated. "Perfect Stay with Incredible Memories"
In my search for a perfect spot to propose on Bali I was looking for a luxury resort that cares about the environment, offers enough privacy and nature and has a nice selection of vegetarian food. Alassari Plantation ticked all those boxes. "Stunning Property and Lovely Service"
We stayed as a family and loved the beautiful room which made us feel like we were right up in the jungle canopy. I had an absolutely amazing stay at the Alassari Plantation! The staff are incredibly hospitable and accommodating. An amazing resort about 45km in land from Kuta, Bali. Natural Jungle environment, with all types of tropical fruit trees surrounding a 5 Star Resort complex with Restaurant, pool, and excellent full service rooms. Lush plantation with many shades of green and luxurious amenities. I stayed in the Bamboo House and I totally loved it. "Serene , calm , rustic. Perfect place for rejuvenating"
If you are looking for a place to relax rejuvenate and kindle with the nature, this is the place. We went with families and kids but is an ideal destination for honeymooners and lovebirds. The owners Valerie and Craig personally take care of you during your stay...meaning to say not just for the money but to give you a 5 star personal experience. The location puts you in a perfect position to trek through the jungle - Which brought to mind images of jungle from the movies. An amazing experience. The entire experience was unforgettable. If you are wanting five star accommodation in amazing villas where your every comfort has been considered, where lush planting gives you complete privacy ... then this is the place for you. Craig and Val are the most gorgeous hosts and all of the staff are so lovely, going out of their way to help however they can. I would rate this as one of the most amazing experiences ever. The owners & staff looked us better than any 5 star hotel. My spa treatments, the delicious fresh food, the drinks (gorgeous cocktails and even champagne! ), yoga bale, the gym, and the stunning views over Bali out to sea from the restaurant were all amazing. Indulgent wellness therapies, massage and yoga among the treetops. Our 5-star facilities include the magnificent Terrace restaurant, swimming pool and the pool-house, where you can enjoy a breakfast, lunch or evening meal. Imagine yourself relaxing in our unique traditional day spa and yoga bale deep in the rainforest. Alassari Plantation is rated by our guests as the best place to stay in Bali for an authentic Bali holiday and to relax, recharge and rejuvenate. Of course, we have all the top resort facilities you would expect of a high quality holiday retreat. Just check out our reviews and testimonials here or at TripAdvisor or Facebook. From relaxation to exhilaration, savour the experiences around Bali. 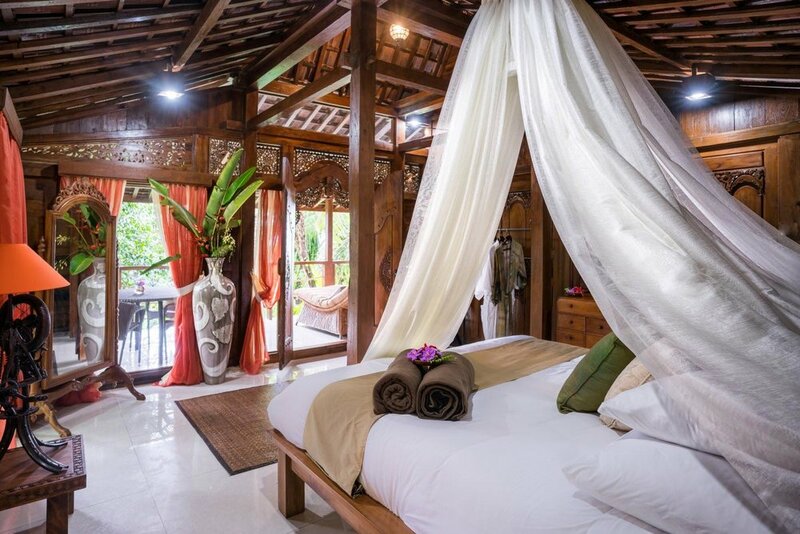 Stay in your choice of huge, intricately-carved, gleaming, wooden, Javanese limasan villas, such as the Dua Honeymoon Suite, or wake up on top of the world in the bamboo Harmony Treehouse. All are furnished with leather sofas. The sumptuous king beds are heavenly and are supplied with luxurious, highest quality linen. Take walks through the lush mountain rainforest with sunbeams and waterfalls. Visit the world-renowned emerald rice terraces glinting in the crystal clear sunshine. There's plenty of interesting tours to take and things to do if you feel inclined not to just chill out. Be sure to check out our special offers — you'll be delighted that you visited Alassari Plantation, we guarantee it! Sample a delicious delicacy while looking over the forest canopy. Your journey to Alassari begins from the moment we pick you up at the airport. Alassari Plantation Bali is a 120 minute drive from Denpasar Airport and is located in the centre of Bali. Your private transfer vehicle will pass through rainforest, local villages and rice fields as you wind your way up Mt Batukaru, Bali's second highest mountain. During your journey enjoy complimentary drinks, nibbles and cool towels.